If you doubt my prognosis, take a look at the man’s 140-page manifesto. Rodger’s narcissistic ramblings read like Patrick Bateman crossed with Raphael Tisserand. Through the entire piece, he displays a pathological obsession with status and money, becoming consumed with envy every time he sees a man with a cute girl. Writing about an incident where he splashed coffee on a young couple out of spite, he stated that he “wanted to kill them [all young couples] slowly, to strip the skins off their flesh.” In another segment, he rages about a former Jewish roommate of his who had a girlfriend despite being three inches shorter. The man was a true misanthrope: no matter whether you were man or woman, white or black, fit or fat, he would find something to hate about you. Feminists are half-correct in claiming that Rodger didn”t see women as human beings. Psychopaths don”t see anyone as human beings, just lumps of meat to be used to further their goals. Throughout his writing and videos, Rodger displays the affect of a serial killer. He has no empathy for others, no spirituality, no emotion aside from a cringeworthy self-pity, constantly calling himself a “victim.” To put it another way, he has no soul. To Rodger, life was a series of mathematical calculations in which he was always coming up short. Being the son of a Hollywood director, with all the privileges that entails, only heightened his self-destructive envy. All the cash and insider access didn”t change the fact that he was a bad egg from the start. There’s a stray cat in my neighborhood that’s taken a liking to me. Every so often, the little tabby leaves a gift for me on my front step, usually a dead mouse he caught while roaming the streets. A couple weeks back, he brought back something I hadn”t seen before: a baby bird. It couldn”t have been more than a few days old, as its wings were barely formed and it had no feathers on its stomach. I initially thought it was a frog when I first saw it. The feminist notion that women could magically sense Rodger’s “misogyny” and avoided him because of it is moronic. As any DV shelter volunteer will attest, women fall for bad men all the time. But you occasionally come across someone who is so broken that no amount of therapy would fix them. 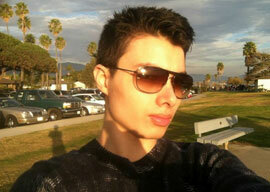 Elliot Rodger had every advantage in life”money, status, good looks”and still struck out. No amount of feminist education would have changed the fact that there was a gaping black hole where his soul was supposed to be. Mentally masturbating about his motives is like asking why some chicks don”t get to fly.